Bright Medi-Weld Appliances excels in rendering a qualitative gamut of Respiratory Protection equipment, which is offered to the clients at leading market prices. The respiratory protection equipments are used to protect the operators from harmful contaminated environment & ensures Safe breathing conditions. 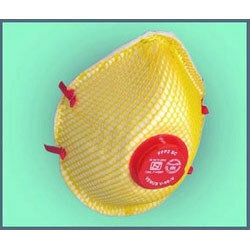 All the respiratory protection equipments as per the industrial safety norms. 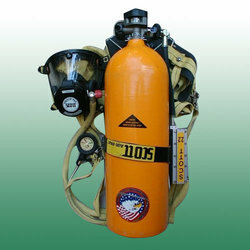 The respiratory protection equipment consist a wide range of mask, canister, oxygen kit, SCBA, dust mask, particulate respirators etc. Cylinder : Single cylinder fitted with valve as per IS specification.High tensile steel cylinders, seamless, certified by chief controller of explosives, Nagpur, for storing compressed Air. Reducer : Exclusive and efficient two stage pressure reducing system which is safer than single reduction. PTFE Lined hoses : Both PTFE lined high and low pressure Hoses with stainless steel outer braiding and end fittings. Each hose is tested at double it's working pressure. 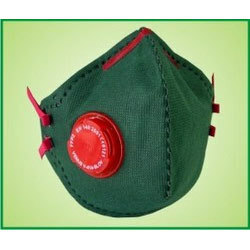 Demand Valve : Efficient lung operated Demand valve fitted to Air tight face mask with wide vision polycarbonate visor. Warning Whistle: loud warning whistle, sounds continuously when 5-7 minutes of supply is left. Mask : Moulded Rubber Mask with speech transmission diaphragm & an exhale valve. 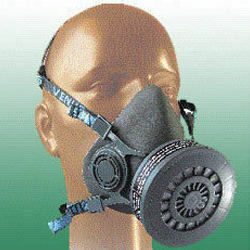 Mask is provided with quick snug & release head harness. The design is such that it reduces the misting effect. Back Plate : Welded steel and bonded powder coated back plate. Stainless steel cylinders bands are used for locking the cylinders to back plate. Cylinder Valve : The cylinder valve operates by a hand wheel & provides maximum ease & comfort to wearer for opening & closing. Harness : Simple construction nylon wheel allows to straps & incorporates quick release waist buckle & chest strap. 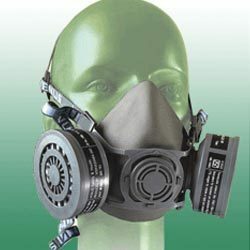 Our Company introduces Half Mask V-500 with 1000ppm canister to protect the operators from harmful contaminated environment & ensures safe breathing conditions Half mask Face-piece is made from soft TPE material (Thermoplastic Elastomer) in grey color material.Produced from non-allergic, Soft & odourless material to ensure high comfort. Automobile industry, Battery Industry, Bulk Drug & Pharmaceuticals, Chemical Spills, Chemical & Allied Industry, Fertilizers, Heavy Electricals, Industrial Cold Storage, Metal & Metallurgy Industry, Pesticides, Paint/Industrial Painting, Heavy Duty Welding, Plastic/PVC/Rubber industry. 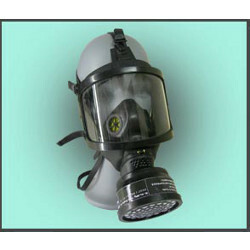 Our company introduces Half Gas Mask with dual 1000 ppm canister for additional safety. 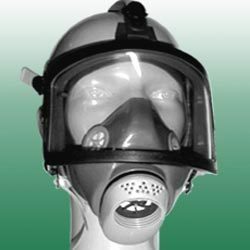 Half mask face-piece (CE Approved EN:140:1999) is made from soft TPE material (Thermoplastic Elastomer) in grey colour material. produced from non-allergic, soft & odourless material to ensure high comfort.